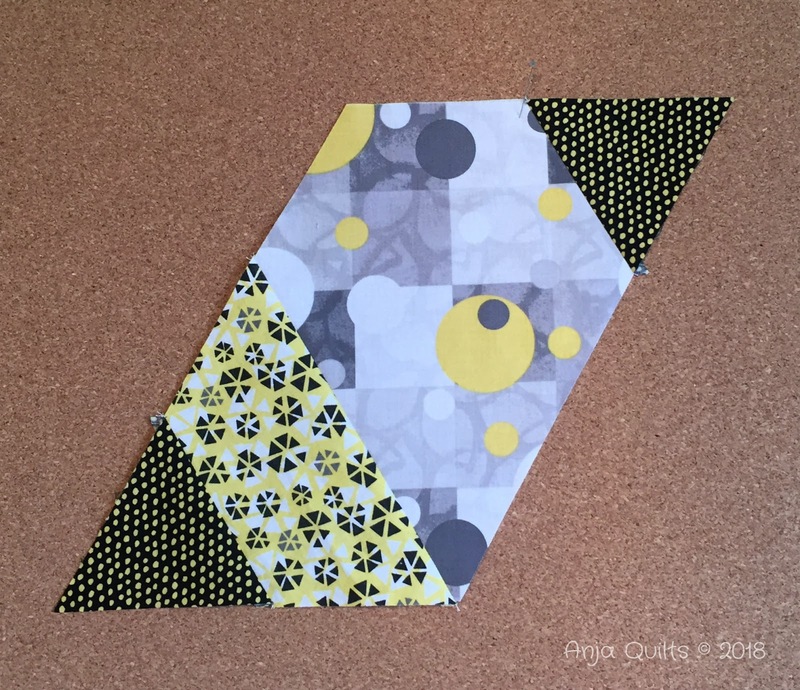 The Wonton quilt by Jaybird Quilts is one my FAL 2018 Q2 goals. 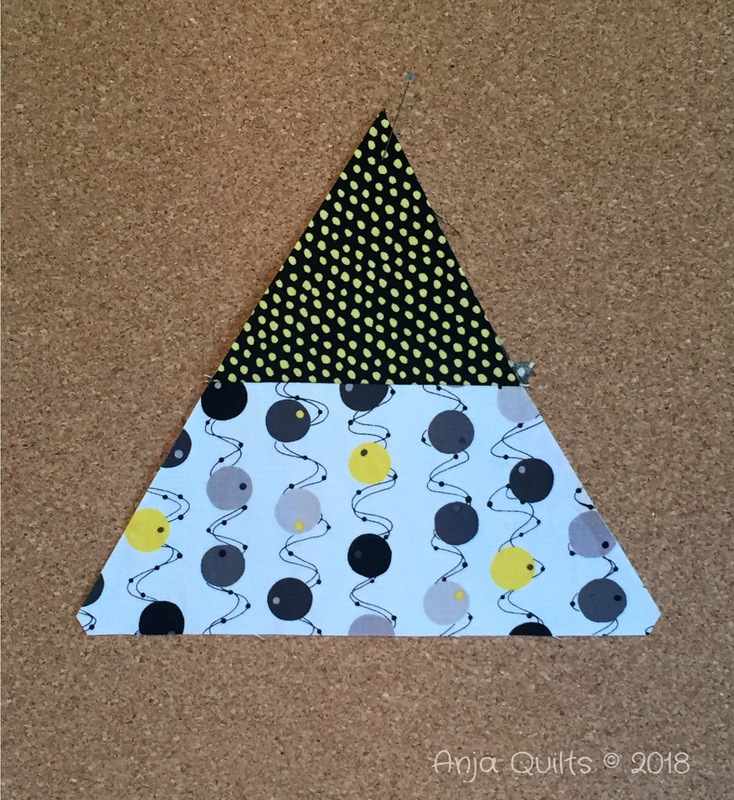 Cutting went fairly quickly, but I discovered on the last couple of strips that I was cutting the jewel shapes incorrectly, so I ended up with a bunch of small and large triangle off cuts. Sigh....I wondered why I needed to cut more strips. 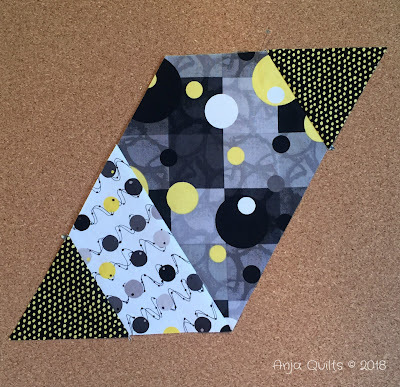 Oh well....now I have triangles at the ready to make another quilt. Sewing the pieces went very quickly. I chain pieced the two sections of each block. The grey colours really didn't come through very well. And then I put the two halves together. There are two different colour ways of the blocks -- here is the light grey version. The plan is to get these blocks pieced this weekend. I'm hoping then that inspiration will hit on how to quilt this and what colour thread to use. Can't wait to see this come together. Oh, great fabrics. I'd be tempted to use a yellow thread for the quilting, but you do have a lot of great options to audition. 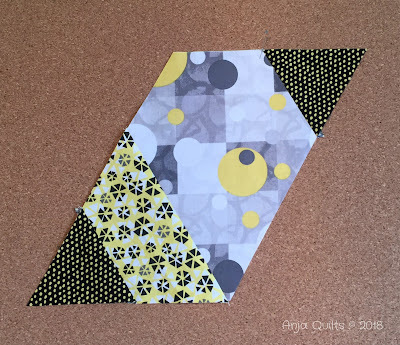 Have fun piecing! Yellow! Yellow thread for the quilting would be awesome. Maybe a medium yellow that matches those big circles? Such a fun quilt. 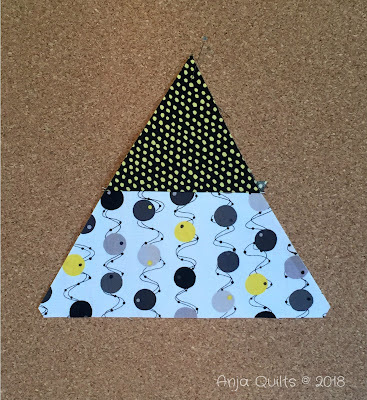 Sorry about those triangles but we've all been there. You could use them in a different quilt, or sew them together and piece them into the back. That would be fun! Thanks for sharing this on Wednesday Wait Loss. Going to be another beauty. Mmm, mmm, mmm! This is going to be another beauty! I’m loving the fabrics you’ve chosen and look forward to seeing how it pulls together! I agree that yellow thread would look spectacular! And Jennifer is right! Your miscues would look awesome on the backing! I believe Angela, the Goddess of Quilting, often recommends a pale yellow for blending with lots of colours. Or light grey. Either would work for you! Have a great weekend. 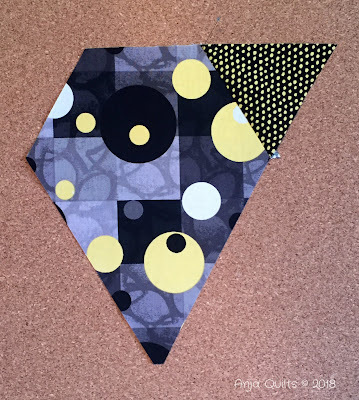 I love the grey and yellow combination and I agree with the yellow thread suggestion too. It’s coming together beautifully. Is t it funny how most of us sew like fiends and then or even while we sew we agonize about how to quilt it! Can't wait to see how this turns out with the two shades of the grey!